This article written by Connie Williams. (Editor's note: For the next year, we will present a series of articles that examine the years around 1900. Our purpose is to provide a comparison of the beginning of the 20th Century to its upcoming end. The author, Connie Williams, is doing graduate work in history at St. Cloud State University and has worked at the Paynesville Area Museum for several summers. St. Valentine's Day, Feb. 14, is a holiday honoring lovers. One sweet day that breaks up the long winter and melts hearts like snow on a warm spring day. It makes one think of valentines, love, cupids with arrows, and the colors red, pink, and white. Department stores sell women's lacy lingerie and men's boxer shorts with hearts on them. The day also brings to mind chocolates in heart-shaped boxes. It is a delight to be the first one to choose a chocolate out of a new box. Deciding which piece of mouth-watering chocolate to pick out of the box can drive you crazy. Dark chocolates, milk chocolates, white chocolates, cremes, caramels! The sweet aroma of chocolate draws its pupil dilated, drooling victim to it helplessly, hopelessly. With trembling fingers you choose a piece and take the first luscious bite. Your toes curl up in ecstasy as the creme filling spreads out across your lips. "Step into my web," said the spider to the fly. "Ha! Ha! Oh! That chocolate fix!" The large valentines card in the back and center are from the collection of valentines owned by Bertha Zniewski of Paynesville. They date from the 1920s. Current valentines are in the front at left and right. This wonderful holiday, derived from a martyr who lived in the third century - St. Valentine, is on his feast day, Feb. 14. He has become the patron saint of lovers. 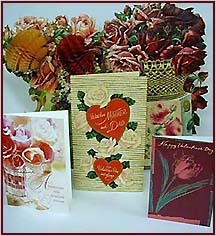 Cards and chocolates are still the best sellers for Valentine's Day at the Paynesville Corner Drug. These days men are the primary buyers of boxes of chocolate, according to Judy Stanley, owner of Corner Drug. She says that if Valentine's Day falls on the weekend then people tend to go out to dinner more. If it falls on a weekday, then they buy more chocolates. Sue Brauchler at Corner Floral said her big sellers are traditional red roses, balloons, and stuffed animals. Mixed flowers and plants are very popular, also. The colors of the roses actually have different meanings. For example: red is for love; pink means perfect happiness; white is innocence or purity; yellow is for friendship or affection. In Sue's opinion, younger men, say maybe 50 or younger, seem to value women more now. They take joy in buying gifts. It is a very busy time for the floral shop. Preparations have them up early and going to bed late. The secondary school alone keeps them extremely busy. Teens today have more money to burn. They order so many flowers and balloons that Sue said they have to stand in school and hand out the orders because the office won't take time to do it anymore. Trish Skahan, a teacher at Paynesville Area Elementary School, said the look of valentines has changed over the years. Much more commercial now, cards use whatever is popular in music or on Disney or in the theater. Valentines even have holograms on them now. What has stayed the same over the 22 years she has been there though is the need to celebrate the day. Each child makes his own little box or bag. The valentines still come in a little white envelope in which the child puts candy hearts or a stick of gum. The teachers still encourage that if you give to one you give to all. "We all make one another feel positive," she said. According to English authorities, the crocus was the flower of St. Valentine. A man had to wear a yellow crocus in his buttonhole if he was to be lucky in love. By 1890, the "daffodown dilly" had taken the place of the crocus. It was a very popular fancy to wear a daffodil on Valentine's Day. Florists made large displays of these delightful spring flowers on the 14th of February. In the 1890s, a bay leaf was pinned to each corner of the pillow and a fifth at the center brought dreams of one's valentine. A popular love potion, you may want to try, if you have the nerve, is to boil an egg hard, remove the yolk, fill the cavity with salt and eat it shell and all to ensure dreams on the night of Valentine's Day. LeRoy Hillbrand remembers celebrating Valentine's Day in his country school about 75 years ago. "There was a big box and all the valentines were put in it," he said. Sometimes cookies were served, but not always. You could buy valentines for a penny apiece or you could make your own. Catalogs like Sears had colored pictures in them at that time. The kids would cut them and paste them and make their own valentines. He said that girls did a better job of making valentines than boys did. "But," he chuckled "boys enjoyed getting them just as much." Through the years, the theme of Valentine's Day remains love, as touchingly expressed in this 19th century poem. She read it over line by line. I could not help but hear. And lit light of days long dead? The year before we wed.
a word of love to that lone heart"
Her chair, and heard a sob of pain. I soothed her, kissed her, called her mine.